Caerphilly, UK — Increased demands for efficient recycling has resulted in plants such as Re-Gen Waste Ltd. based in Newry, Northern Ireland to be processing over 140,000 tonnes per year of MDR, in a 24-7 operation. To ensure Re-Gen’s continuous success, earlier in 2017 a GBP 2 million (approx. USD 2.67 million) expansion was carried out as part of a nine million pound wider investment, including the upgrade of Re-Gen’s MDR (Mixed Dry Recycling) and paper recycling lines. As part of the expansion Re-Gen required maximum ferrous and non-ferrous metal recovery from the two upgraded waste streams. In order to improve metal recovery Re-Gen tasked Eriez Europe with selecting magnetic separators suitable for the required metal recovery. 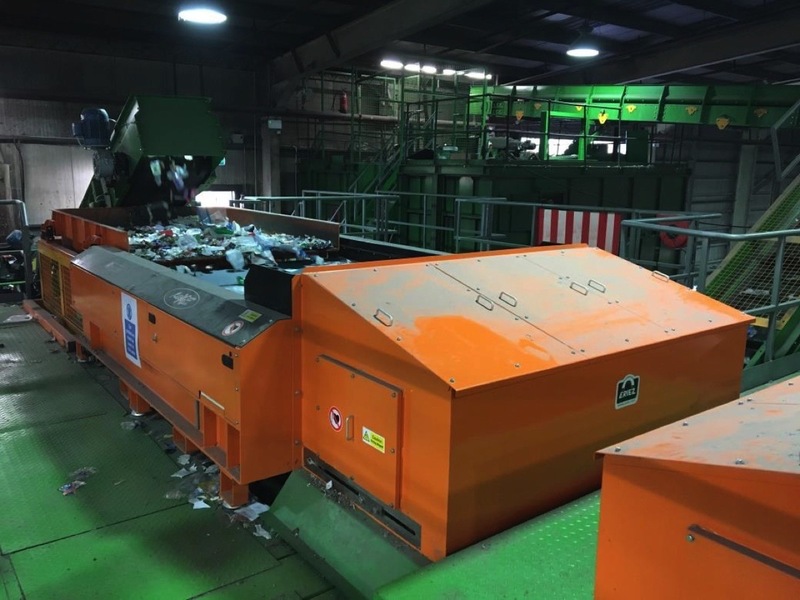 Subsequently two identical 2000 mm wide ST22-80 Eddy Current Separators (ECS) were supplied and installed on the MDR and paper recycling lines in addition to the existing ST22-80 ECS on the MSW (Mixed Solid Waste) processing line installed in 2015. The two ECS units include Eriez OBM Vibratory Feeders to maximise material spread across the full width of the ECS units, allowing for optimal separation performance. On both waste streams the ECS units are removing valuable Aluminium from material such as paper, plastic and film at throughputs up to 30 tph. Eriez Rev-X ST22 ECS installed at Re-Gen Waste Ltd. In addition to the non-ferrous separation solutions provided by Eriez Europe, a CP20/120 Overband Magnet was installed to recover profitable ferrous metal, as well as providing protection for the ECS units downstream. The high levels of metal separation from the new Eriez ECS units have contributed to Re- Gen reducing overall contamination. In addition to providing higher quality waste material and increasing profitable aluminium recovery by 2%. Re-Gen Waste’s Mechanical Engineer, Louth McMahon comments, “Recent changes in the market prompted Re-Gen to identify areas for improvement in our MDR and paper processing lines. Eriez Europe assessed our requirements and supplied two new ECS systems which are proving very effective in reducing our metal contamination and improving the quality of our recycled materials.